Christmas Nail Tutorial... - Sleek For Yourself! Christmas Nail Tutorial... | Sleek For Yourself! So as we are getting closer and closer to Christmas I thought it would be nice to do another Christmas themed blog post and this time I decided to go for a nail tutorial. Every time someone uses that hashtag The Body Shop donate money to War Child and Water Aid! I thought it was a for a really good cause and it sounded like a lot of fun so why not? I decided to go for four different designs. I wanted something for everyone. 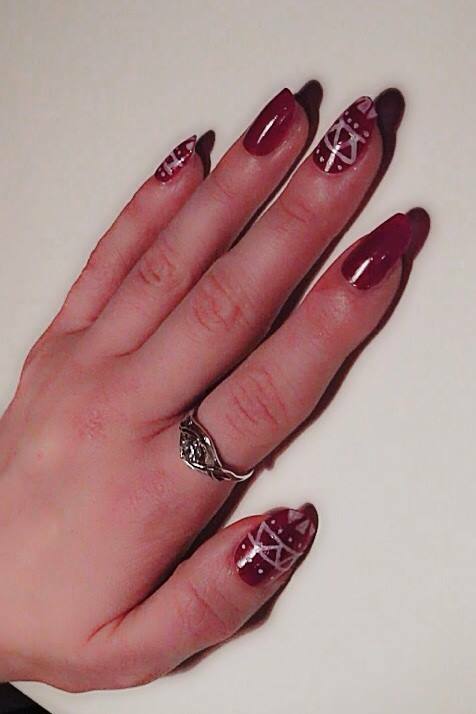 I know some people really love anything christmassy and like to go all out over the Christmas period, some people like to have that festive pattern but not something that SCREAMS crimbo and some people like pretty sparkly nails that don't necessarily have to mean festive at all but look especially good this time of year. Two of the designs are really really simple, short and sweet. And if you want to try something a bit more intricate, there are two more designs that take a little longer. There are no super difficult ones! Here are the four finished designs for you to choose from. Before you start any of them you will need to follow these steps to prep your nails for the best results. 1. Remove any existing nail polish you may already have on! 2. 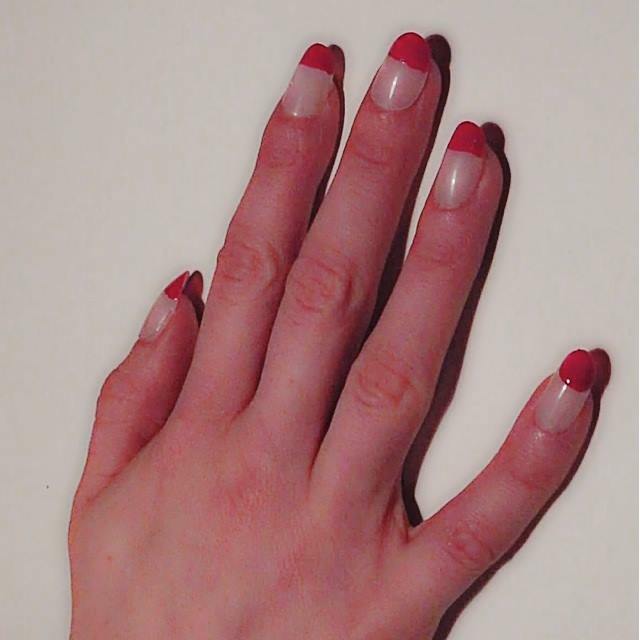 File your nails into the shape you would like them, try and make them all even but it's not essential. 3. 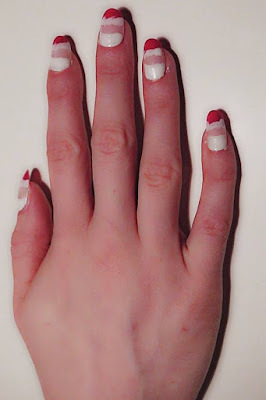 Buff your nails to give a good surface for the nail polish. 4. Using a cuticle pusher just gently push back your cuticles to help promote healthy nail growth and to give a better edge for the polish. 5. Wash your hands and under your nails so they are squeaky clean. Voila! You are now ready to go! I hate my natural nails, they tend to break very easily and end up all different lengths and shapes so if you too have uneven nails, short nails or non-existent nails then you may want to use false nails? 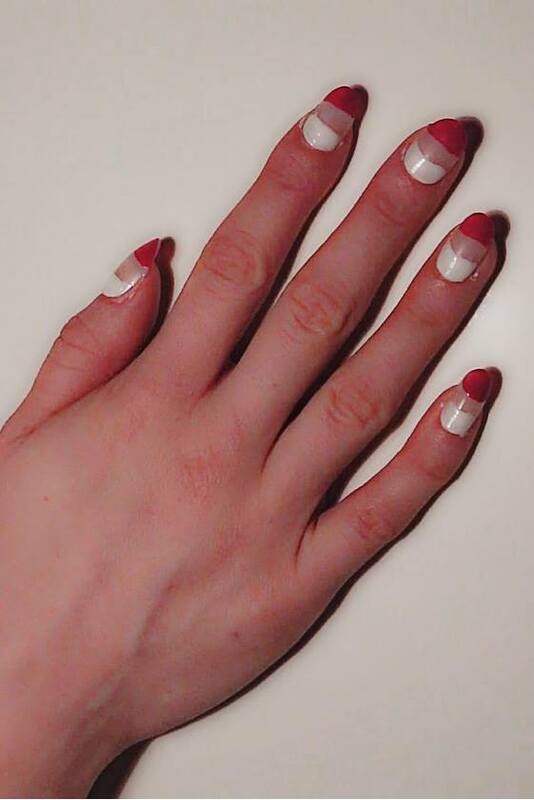 Longer nails means more space to work with so I find it a little easier. 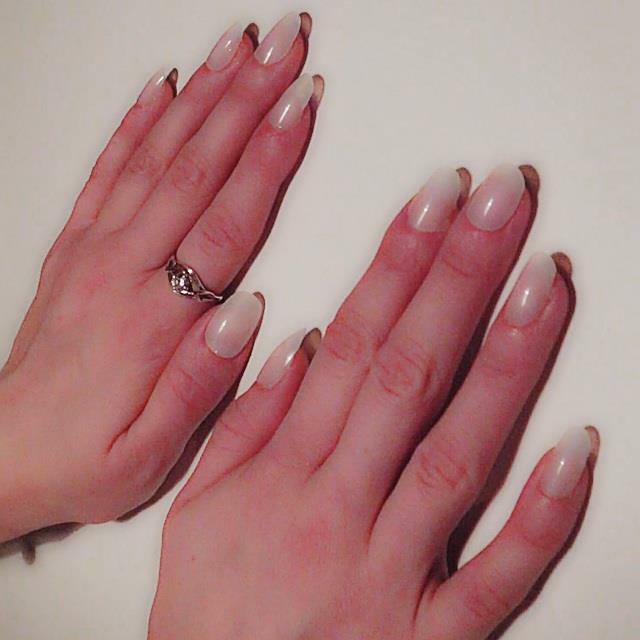 If you do decide to use false nails obviously use clear ones. 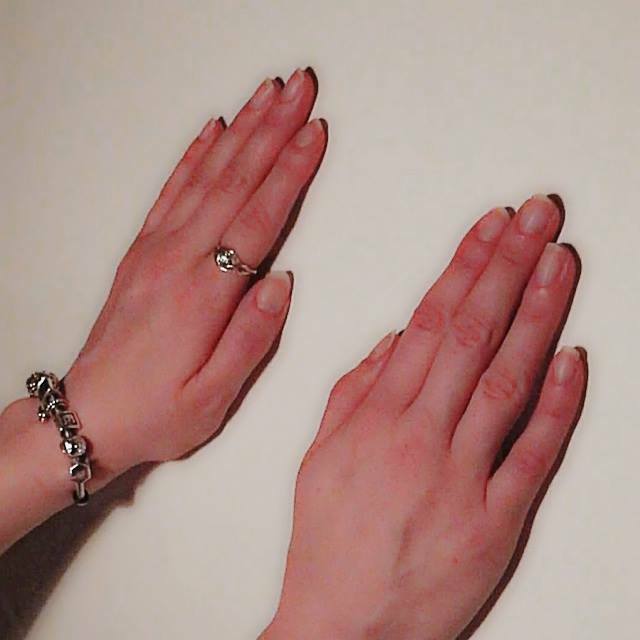 Some people find painting false nails that have already been applied very difficult, especially when painting your left hand (or right if you are left handed) so please feel free to paint the designs on the nails before applying them (just make sure they are completely dry). 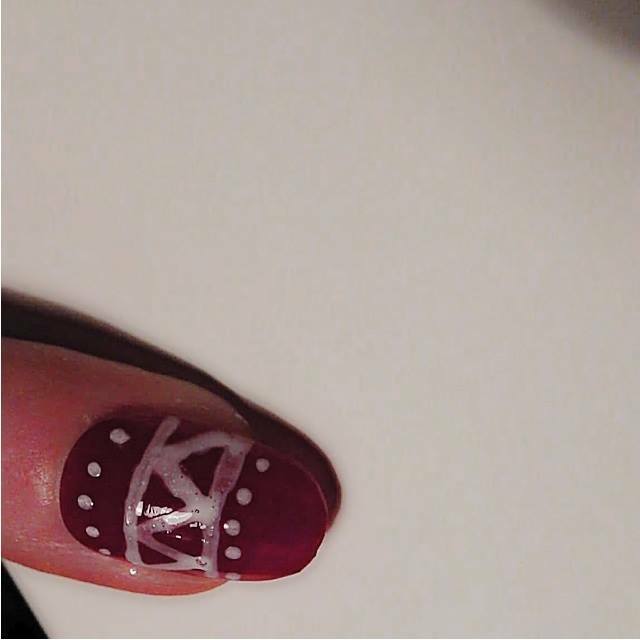 This is one of the easiest of the four nail designs. 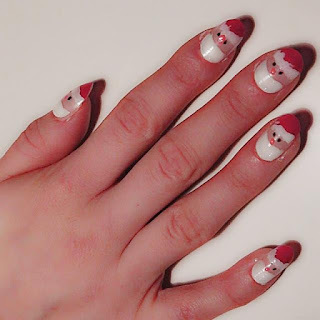 This is how I had my nails last Christmas and I adored them. As they are plain red nails with half of them glittered I do find they don't necessarily have to mean Christmas but they do look lovely and festive when the glitter catches the lights. One red nail polish. 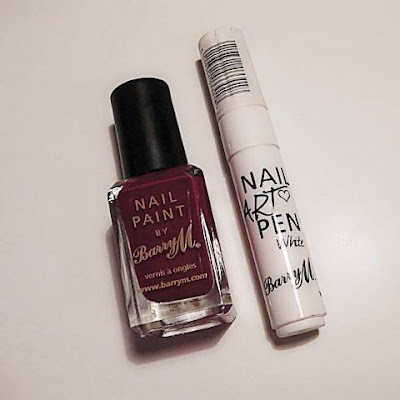 It can be any nail polish but I am a big fan of Barry M so I like to use this one which is...Blood Orange 410 in the Gelly Hi-Shine Nail Paint. 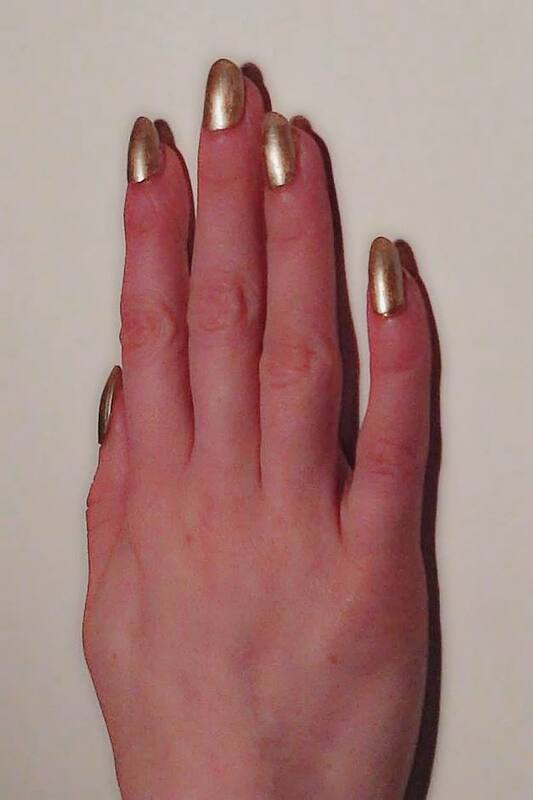 One gold glitter polish. Again any gold glitter will do but I like Yellow Topaz Glitter 351 Nail Paint as it has bigger bits of glitter as well as little specks to fill the spaces. One top coat, any will do. One base coat, any will do. Step 1. Starting with freshly cleaned nails, apply a base coat. This is just to prevent any staining from the red and also it gives a nice base for the polish to set on. Step 2. 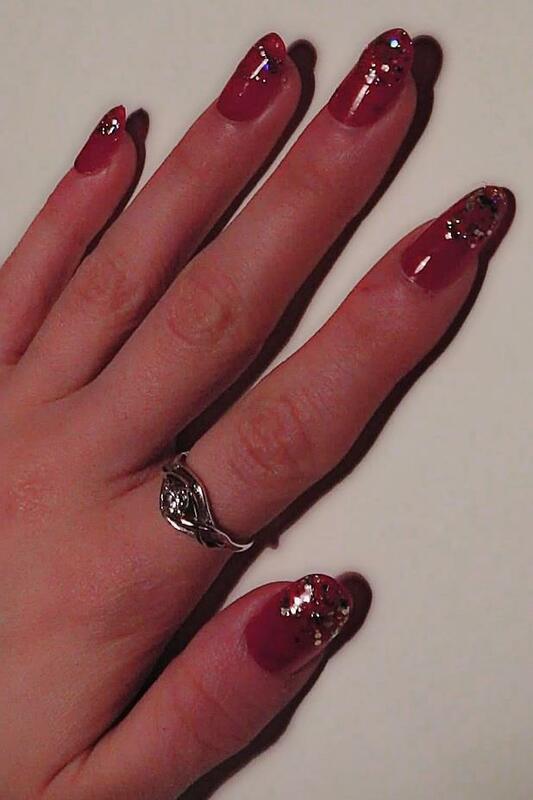 Once dry, apply two layers of your favourite red nail polish, make sure the layers are definitely dry in between as it will cause bubbling if not. Also try not to do it too thick as it will be very time consuming waiting for it to dry. Step 3. 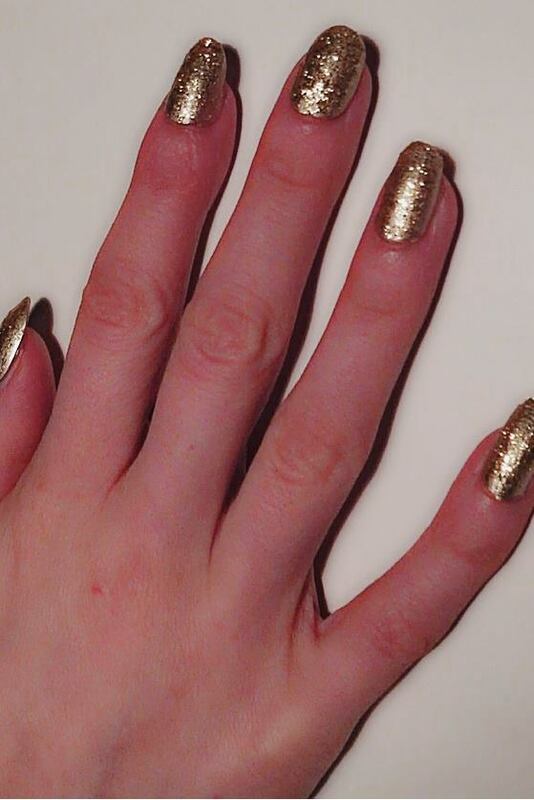 Apply your gold glitter by gently tapping it onto the top half of your nail. 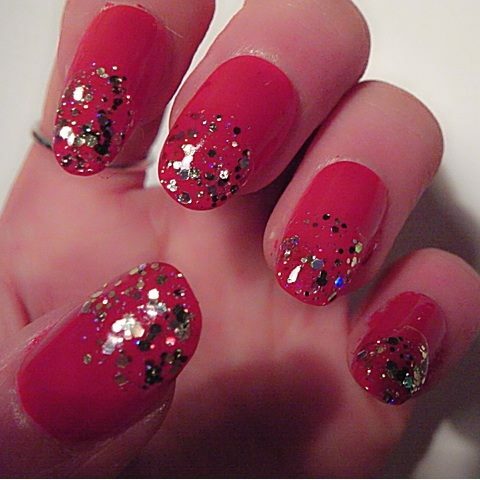 You can do as many layers as you like, the more layers the more glitter so it depends how sparkly you want them. Step 4. Apply a topcoat to give your nails that extra bit of shine and to keep them from chipping for longer. Step 5. Wait for your nails to be completely dry, and then sit back, and enjoy a nice glass of wine! 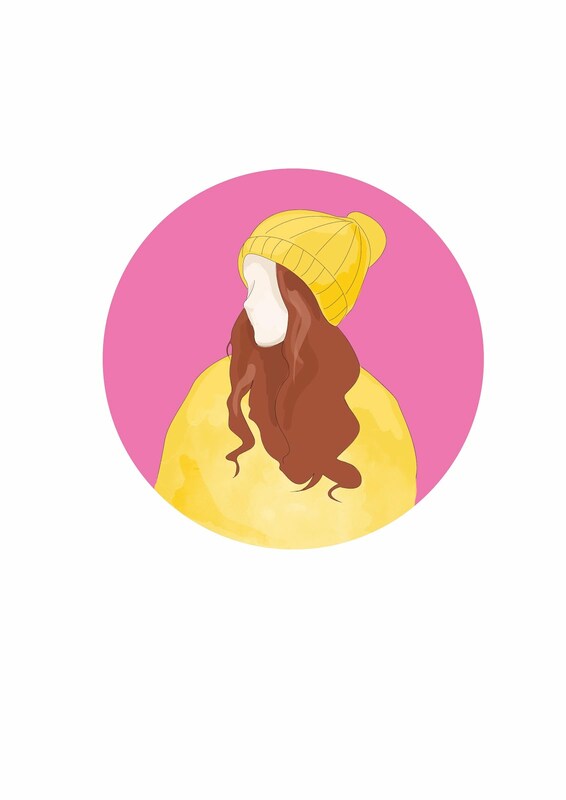 This is the easiest design, its very very simple and doesn't take long at all, I also find this colour goes with pretty much everything. I'm a big fan of glitter nail polishes so this is a regular choice for me. These nails can also be made more festive by adding nail decals or stickers on top. For this look I like to use Barry M Instant Foil Effects in 320 which is a lovely gold colour and it gives a great finish. With the glitter polishes you do have to use a base colour underneath because otherwise you would have to do hundreds of layers of glitter to actually cover your nails! 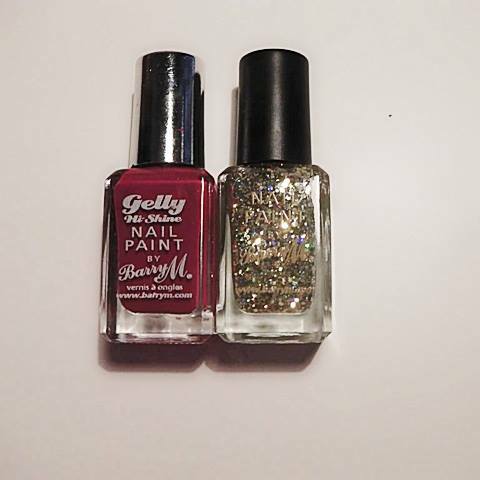 The glitter nail paint I'm using is Barry M 339 Gold Glitter. Step 1. Starting with clean fresh nails, apply a base coat. Step 2. Once dry, apply one layer of the foil effect gold nail paint. Step 3. 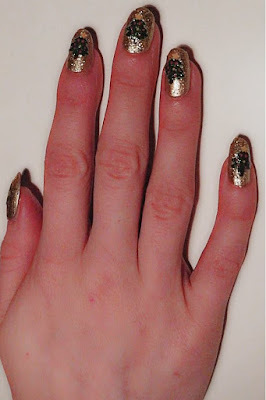 Once dry, apply the gold glitter. 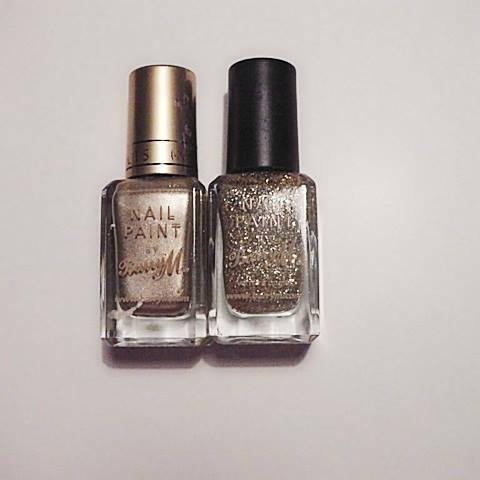 One layer will give a nice shimmer, two will give good coverage but I recommend three for extra sparkly nails. This picture shows two layers. Step 4. 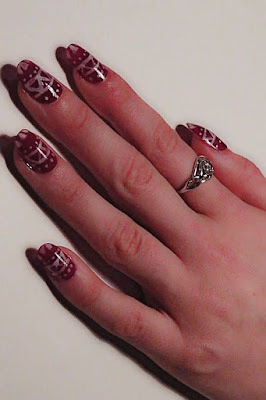 If you find this design is nice but is missing a little something, you can experiment with different nail stickers. 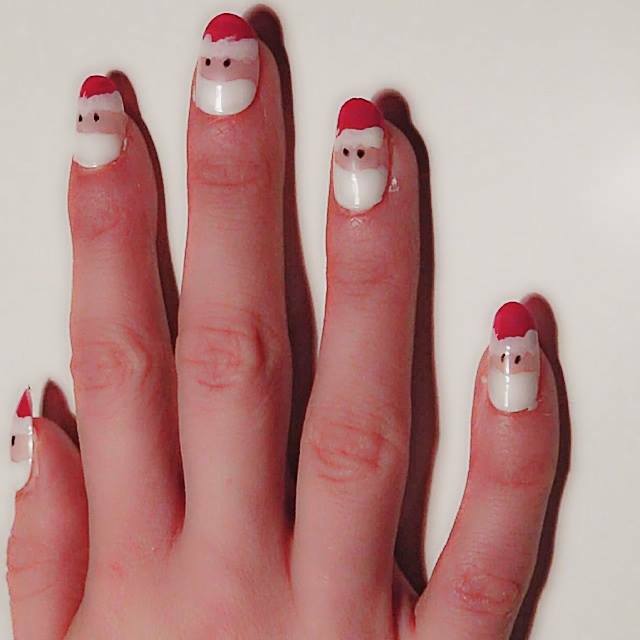 I found these Christmas tree stickers in Body Care, they were very cheap but they just add a little bit of festive fun to your nails! 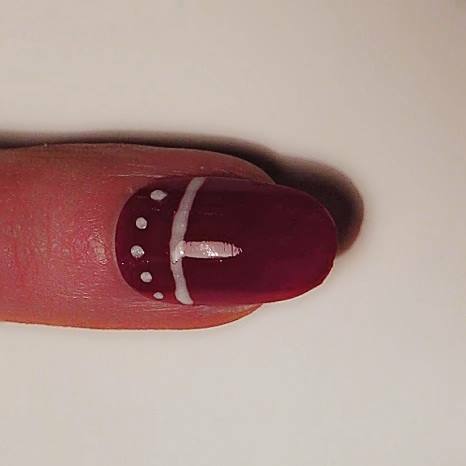 If you do use nail stickers then apply carefully with tweezers as they can be very delicate and difficult to apply. Step 5. 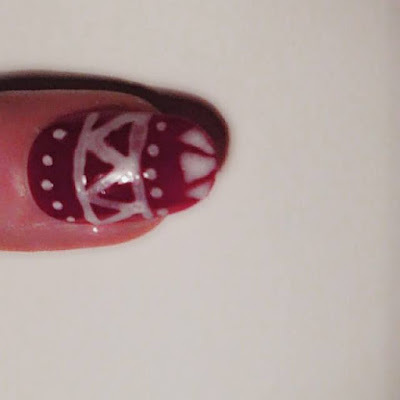 Wait for polish to set and then apply a topcoat to keep any nail art on, then chill out and watch a Christmas film. It's gotta be The Grinch. You know this. You will also need a black nail art pen which are easy to find or even a black nail polish is fine. and one cocktail stick/ dotting tool or a steady hand. When doing this one make sure you don't paint the nose in between the eyes. (see picture) That's my only advice. Hahaha! Step 1. Start with clean fresh nails and apply your base coat. Step 2. 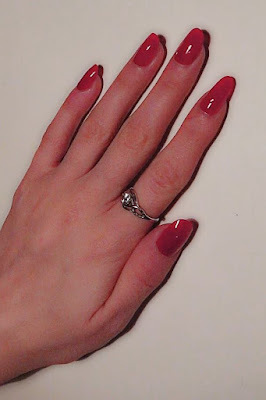 Once dry, gently sweep your red polish over the top of the nail, this does not have to be neat so no worries if it's not straight. Step 5. Once that has dried, using your black nail art pen or polish put two dots under the fur for his eyes. Step 6. Using a pink nail art pen or polish dot a little button nose just above the beard. Step 7. 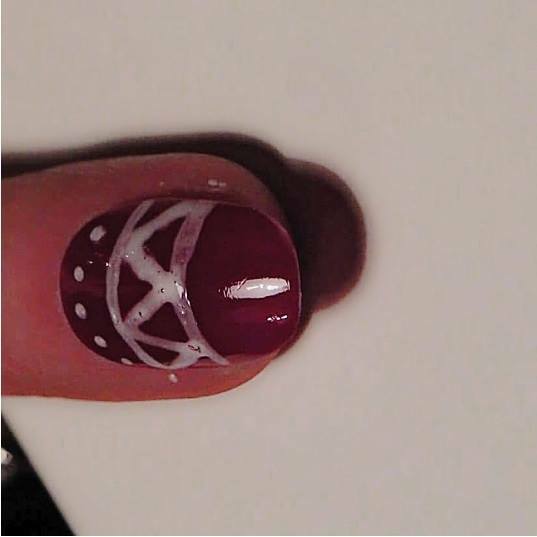 Apply a topcoat to seal in the design then once dry put some xmas music on and have a dance in your pants! You know you want too! This is my personal favourite. I think it looks really effective and when I had these on a few Christmases ago everyone commented and were impressed I had done them myself. Step 1. Start with clean, fresh nails and apply a base coat. Step 2. 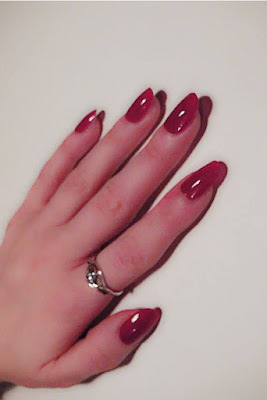 Once the base coat is dry apply two coats of the red polish. Step 3. You must be certain they are dry before continuing. 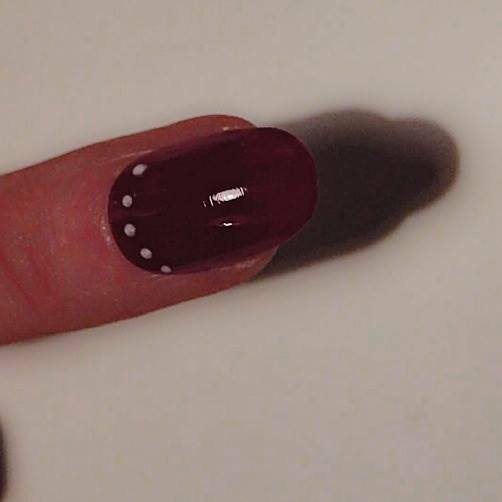 When it is dry using the white nail art pen put 4 or 5 dots along the bottom of your nails. Step 4. Next apply one straight line above the dots. (This picture has a line upwards but that is the reflection, not the pattern!). Step 5. Add another line just above, leaving some space in between. Step 6. Fill in between the lines with diagonal lines forming triangles. Step 7. Above the pattern repeat the line of dots. Step 9. Once your nails are all dry be sure to apply a topcoat as nail pens can rub off easily. the topcoat will keep them for longer. 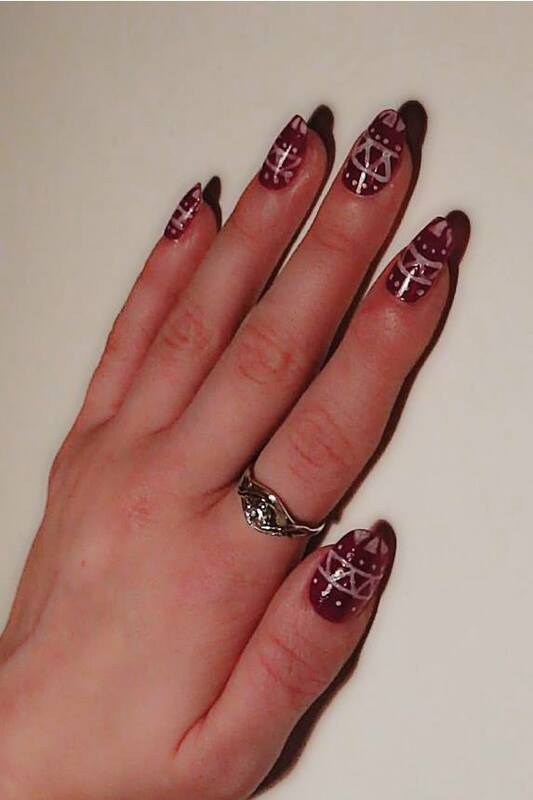 You can choose to leave the nails in between, I personally think this looks really nice! However, you can do every nail to really make them stand out which also looks great! Step 10. When you are finished, grab your handbag, go brave some xmas shopping and show them off to the world. I hope you all liked my nail tutorial. 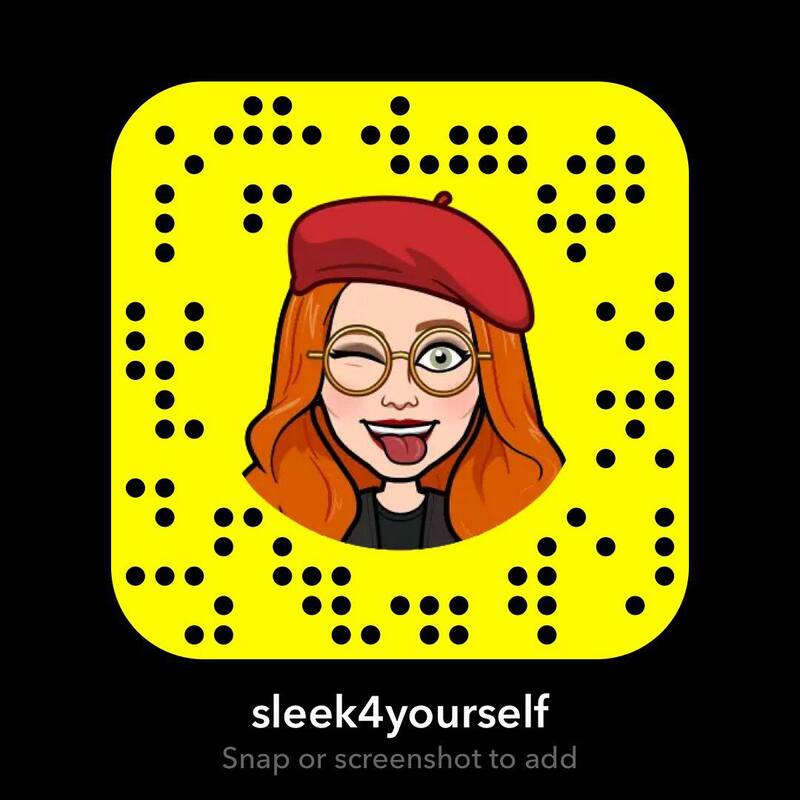 if you do decide to give it a go let me know by tagging me in the pictures. Don't forget to #nailit4charity so The Body Shop can donate money to War Child and Water Aid! Hi! Love your post about getting the nails ready for the festive period!!!! !